With the help of Adaxes Web Interface users can perform a variety of Exchange tasks, such as creating and moving mailboxes, establishing e-mail addresses, modifying Exchange-related properties of mail-enabled users, contacts and groups. Each operation has a number of settings that you can customize to simplify the user interface and decrease the number of options available to users. 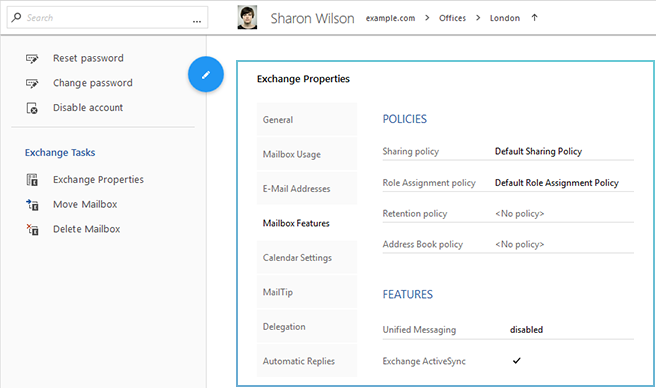 For example, you can granularly configure which Exchange policies and mailbox features are allowed to modify, how to generate mailbox aliases, specify the mailbox database to use by default, etc. The permissions to perform Exchange management tasks are delegated via Security Roles. For more details, see Grant permissions to perform Exchange tasks. The Create Mailbox operation is available when viewing user accounts located in a domain where Microsoft Exchange is installed. If a user already has an Exchange mailbox, the operation is not displayed. 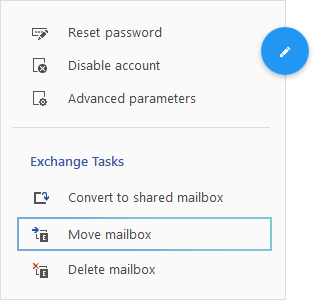 The Create Mailbox, Edit Exchange Properties, and Move Mailbox operations can also be placed on the Actions pane in the Web Interface. For details, see Configure Actions Pane. You can configure how the email alias is generated and specify which mailbox database to select by default. Optionally, you can hide the Alias and Mailbox Store fields. If both fields are hidden, the Create Mailbox dialog will not be shown as the operation will not require any user interaction. 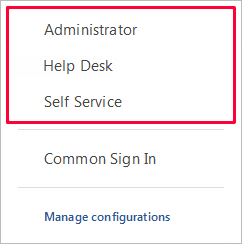 Select Create Mailbox in the Operations list and configure the settings under the Configuration tab located to the right. To completely disable the Create Mailbox operation, uncheck it in the list. For more details, see Disable Operations on AD Objects. By default, mailbox aliases are generated by Property Patterns. To generate aliases in a different way, select the Change the default value option and specify a new template in the New default value field. For example, if you use the following template: %firstname%.%lastname%, the alias will be composed of the user's first name and last name separated by a period. To hide the Alias field, check the Hide from UI checkbox. By default, the database for new mailboxes is selected automatically based on settings configured in Property Patterns. For details, see Predefine Selection of Exchange Mailbox Stores. 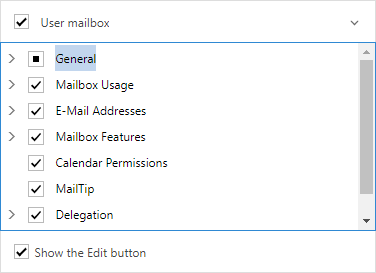 To override the settings, activate the Select the following mailbox database by default option, and select a mailbox database from the drop-down list. To hide the Mailbox Store field, check the Hide from UI checkbox. The Edit Exchange Properties operation is available only for users that have an Exchange mailbox and for mail-enabled objects, such as users, contacts, and distribution lists. You can granularly configure which Exchange	properties are available for the Edit Exchange Properties operation. Select Edit Exchange Properties in the Operations list. Under the Configuration tab located to the right, select the Exchange properties you want users to be able to modify. To completely disable the Edit Exchange Properties operation, uncheck it in the list. For more details, see Disable Operations on AD Objects. 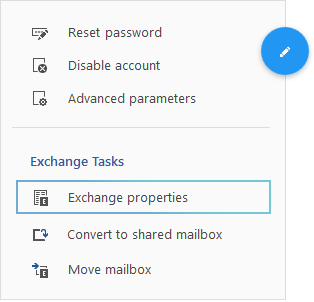 The Exchange Properties section in object views is available only when viewing accounts of users that have an Exchange mailbox or mail-enabled objects, such as users, contacts, and distribution lists. 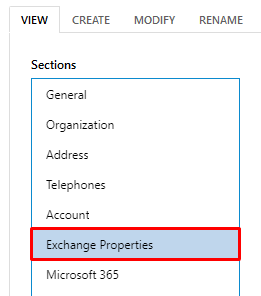 In the Forms and Views section, select the type of Active Directory objects, for which you want to customize the Exchange Properties section. 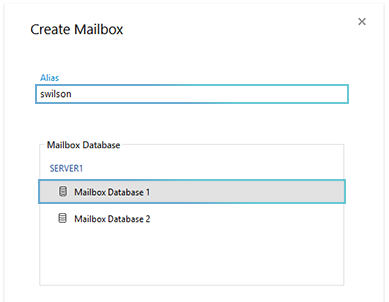 Select User to customize the section for mailboxes and mail-enabled users. Select the Exchange Properties section in the Sections list. If the object view doesn't contain the Exchange Properties section, you can add it there. 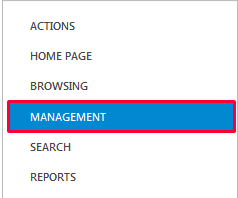 Click the Add button located under the Sections list. 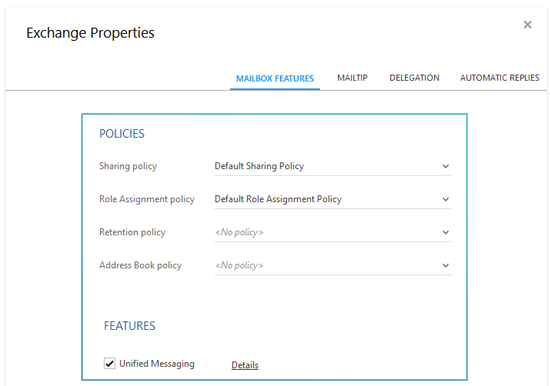 On the Section Contents step of the wizard, select Exchange properties. Follow the instructions of the wizard to complete the operation. Under Section Configuration, specify which Exchange properties you want to be displayed on the view. 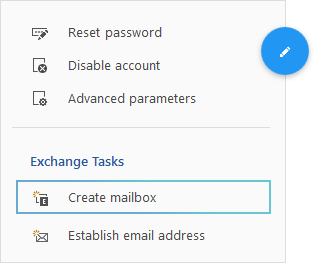 The Move Mailbox operation is available only for users that have an Exchange mailbox. For the Move Mailbox operation you can configure whether the primary and/or archive mailbox can be moved, specify the target mailbox database to select by default, set default limits for corrupted and large items, etc. Select Move Mailbox in the Operations list and customize the operation under the Configuration tab located to the right. To completely disable the Move Mailbox operation, uncheck it in the list. For more details, see Disable Operations on AD Objects.